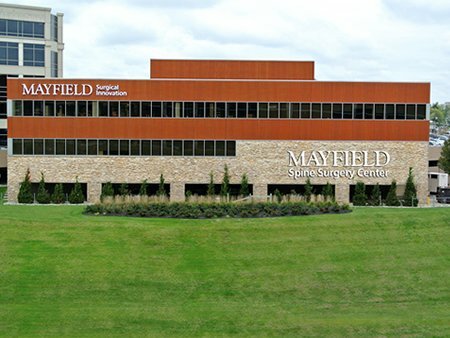 For more than 80 years, Mayfield Brain & Spine has been building its global reputation in spine surgery. Our dedication to the diagnosis and treatment of spine injuries and disease enables Mayfield to treat more spine patients than any other spine care program in Greater Cincinnati and Northern Kentucky. And since Mayfield is also one of the leading brain surgery centers in the United States, it is no wonder that more than 25,000 patients from around the world choose Mayfield for their neurosurgical care each year. Our team is one of the largest and most experienced networks of spine specialists in the United States. It includes board-certified physicians in neurosurgery, physical medicine and rehabilitation, and pain management, as well as licensed physical therapists and advanced practice providers. Our complex spine surgery team includes six surgeons with advanced training in complex spine problems such as spinal deformity and scoliosis. Our minimally invasive surgery team includes more than a dozen surgeons, who by making small incisions and using long, slender instruments, help patients recover more quickly than ever with shorter facility stays and less pain. In fact, 47 percent of our spine surgery patients underwent same-day surgery last year. Many were treated in our free-standing outpatient spine surgery center in Norwood, Ohio. The center was one of the first of its kind in North America when it opened in 2007, and since then has provided more than 45,000 patients with superior service. We participate in health care programs offered by most major managed care providers, and are certified by the Ohio Bureau of Workers' Compensation. We also provide care to Kentucky and Indiana Workers' Compensation patients. In this Mayfield Minute, Dr. Michael Kachmann discusses minimally invasive spine surgery. Dr. Tann Nichols discusses spinal cord stimulation for the treatment of chronic pain. Mayfield presents a patient symposium on a new type of spinal cord stimulation, called high-frequency HF10 Therapy, that delivers 10,000 Hz to provide more pain relief to patients without the tingling sensation (paresthesia). This patient symposium was held Oct 17, 2017 in partnership with Nevro. Drs. Orlando and Bailey have no financial interests with Nevro. In part 1, Dr. Marc Orlando reviews who is a candidate and the SCS trial (test-drive) procedure. In part 2, Dr. Steven Bailey discusses the implant surgery, risks, and results of HF10 spinal cord stimulation. Discectomy is the surgical removal of a herniated disc or degenerative disc material that presses on a nerve root or the spinal cord. The procedure can be performed anywhere along the spine, from the neck (cervical discectomy) to the lower back (lumbar discectomy). To perform the procedure, the surgeon makes an incision in the back, reaching the disc by removing a portion of the lamina, a bone that forms the back side of the spinal canal and creates a protective "roof" over the spinal cord. During a microdiscectomy, the surgeon uses long, narrow instruments to remove disc material through a tiny incision while using a microscope or magnifying instrument to view the disc and nerves. Microdiscectomy and Foraminotomy are used to treat a condition involving a herniated disc and pinched spinal nerves caused by disc degeneration. The procedure can be performed anywhere along the spine, from the neck (cervical spine) to the lower back (lumbar spine). During a microdiscectomy, the surgeon makes a tiny incision, using a microscope or magnifying instrument to view the disc and nerves, and removes disc material so that it no longer irritates and compresses the nerve root. During a foraminotomy, bone is removed in an effort to enlarge the "neural foramen," the space between vertebrae where the nerve root exits the spinal canal. Disc replacement (arthroplasty) is used to treat degenerative disc disease of the neck (cervical spine) or lower back (lumbar spine) that has not responded to conservative treatment. The goal of arthroplasty (restoration) and replacement with an artificial disc is to relieve severe pain and preserve mobility. It is an alternative to fusion, a surgical procedure in which two or more vertebrae (bones) are fused together to immobilize the spine. Neurosurgeons, approaching the spine from the patient's front, implant components of the artificial disc after removing the degenerative spinal disc. Disc replacement is relatively new in the United States, and the short- and longer-term benefits are still being studied. Decompression is used to treat spinal stenosis, a condition involving a narrowing of the spinal canal. Spinal stenosis can cause pressure and pinching of the spinal nerves, which can result in chronic pain, numbness, and muscle weakness in the arms or legs. Spinal decompression can be performed anywhere along the spine, from the neck (cervical spine) to the lower back (lumbar spine). To perform the procedure, the surgeon makes an incision in the back, removes the bone that forms the back side of the spinal canal, removes bone spurs that are present, and creates more room for the patient's spinal nerves. Minimally invasive decompression is used to treat spinal stenosis, a condition involving a narrowing of the spinal canal. Spinal stenosis can cause pressure and pinching of the spinal nerves, which can result in chronic pain, numbness, and muscle weakness in the arms or legs. Spinal decompression can be performed anywhere along the spine, from the neck (cervical spine) to the lower back (lumbar spine). To perform the procedure, the surgeon makes a tiny incision in the back. A series of progressively larger tubes, called dilators, are used to tunnel through the muscles. Using long, narrow instruments, the surgeon removes bone spurs and creates more room for the patient's spinal nerves. A minimally invasive incision causes less disruption of the back muscles and may decrease recovery time. A corpectomy is a procedure in which a surgeon removes all or part of the vertebral body in order to take pressure off the spinal cord and nerves. The abnormal pressure is typically caused by spinal stenosis, a herniated disc, or other degenerative conditions. When a portion of the vertebra is removed, it is replaced with a bone graft. The section of bone graft works like a "strut" to support your spine, which fuses over time with the adjacent vertebrae. In some cases, a cage device may be used to span the empty vertebra space. A laminoplasty is a procedure in which the surgeon creates more space for the spinal cord and nerve roots caused by spinal stenosis. The surgeon cuts the bony lamina on one side of the vertebra, and then creates a groove on the other side. The groove acts like a hinge to open the lamina and create an enlarged spinal canal. The opening is then secured with wedges of bone graft to hold the door open. The procedure does not involve fusion. Spinal fractures can be caused by an injury or compression caused by osteoporosis, tumors, or cancer. A spinal fracture must be stabilized so that it does not compress or tear the spinal cord. Treatment will depend on the type of fracture and the degree of instability. It can involve braces and orthotics, instrumentation and fusion, or minimally invasive procedures called vertebroplasty and kyphoplasty. During a vertebroplasty procedure, bone cement is injected through a hollow needle into the fractured vertebral body. During kyphoplasty, the surgeon inserts a balloon into the compressed vertebra, inflates it, and then fills the space with bone cement. The surgical removal of a spinal cord tumor is a treatment option if the tumor is causing symptoms ad surgery will not cause undue harm to the spinal cord. If the tumor is not causing symptoms, the surgeon may recommend keeping an eye on it with routine MRI scans. If the tumor is causing symptoms and growing, complete removal is the optimal goal. If the tumor cannot be completely removed without causing harm, the tumor team may seek to eradicate remaining tumor cells with radiation therapy and/or chemotherapy. A minimally invasive posterior percutaneous cervical foraminotomy is a procedure used to remove bone spurs and herniated discs in the neck that compress a spinal nerve. A pinched nerve can cause pain that radiates down the arm and sometimes into the hand. The goal of the procedure is to enlarge the space where the nerve root exits from the spinal canal, called the foramen. When a bone spur narrows the foramen and compresses the nerve root, a posterior cervical foraminotomy can be used to chisel away the spur to widen the passageway. The surgeon makes a small incision in the back of the neck and then uses a series of tubes to dilate the spine muscles. Anterior cervical discectomy and fusion (ACDF) is used to treat a herniated disc or bone spur that presses on a nerve in the neck area of the spine. It may be an option if your neck or arm pain is not relieved with nonsurgical treatments. Through a small incision in the front of the neck, the disc or spur is removed. A bone graft is placed into the empty disc space. Over time the graft will fuse to the vertebra above and below it to maintain stability and normal spine alignment. Sacroiliac (SI) joint fusion is a minimally invasive surgery that stops the painful motion in the joint connecting the spine and pelvic (hip) bone. A small incision is made along the side of the buttock. Using fluoroscopy (X-ray), the surgeon places two or three titanium (metal) implants and bone graft material to stabilize the joint and fuse the two bones together. SI fusion may be an option if physical therapy and joint injections fail to relieve pain in the low back, buttock or hip that is caused by sacroilitis. The surgery takes about an hour. The patient may go home the same day or following day. Anterior lumbar interbody fusion (ALIF) is used in the treatment of a disc problem that causes pain and instability in the lower back (lumbar spine). It is performed as part of a discectomy, the surgical removal of a herniated or degenerated disc. The surgeon makes an incision in the abdomen, then gently moves the large blood vessels aside to expose the vertebra and disc. The disc is removed, and a cage packed with porous bone is inserted in the empty disc space and secured with pedicle screws and rods. The bone grows through the holes in the cages, fusing the two vertebrae together. An advantage of ALIF is that the back muscles and spinal nerves remain undisturbed. Axial lumbar interbody fusion (AxiaLIF®) is a minimally invasive spinal fusion technique that can be performed as a single- or two-level approach to the lumbosacral region. This area includes two vertebrae (L4 and L5) of the lower (lumbar) spinal column and the first vertebra (S1) of the sacrum (tailbone). The procedures, which require an incision of less than one inch near the top of the buttock and utilize long, narrow instruments, are designed to fixate the lower spine in patients who suffer from degenerative disc disease or spondylolisthesis. The single- and two-level procedures were developed by TranS1, Inc., a medical device firm based in Wilmington, N.C. The minimally invasive procedure minimizes soft-tissue damage and avoids the muscle stripping and retraction associated with conventional fusion procedures. Lateral lumbar interbody fusion (LLIF) is a minimally invasive surgery in which the surgeon approaches the disc space from the patient's side. The surgeon may perform a lateral fusion to treat the region above L5-S1 in patients suffering from degenerative disc disease, spinal stenosis, recurrent disc herniation, or mild spinal deformity in the lower back. The surgeon makes a small incision at the side of the waist. The disc is removed, and a cage packed with bone graft is inserted in the empty disc space. The bone grows through the holes in the cages, fusing the two vertebrae together. The surgery is sometimes called DLIF, which stands for direct lateral interbody fusion, or XLIF for eXtreme lateral interbody fusion. All refer to the same technique. Lateral spine fusion is a unique minimally invasive surgery. First, the small incision is only 1 inch long near the waist. Second, its path to the spine is from the side. The surgeon uses dilation tubes to create a tunnel between the patient's abdominal organs in front and the strong spine muscles in back. Third, a nerve-monitoring probe guides the path to safely enlarge the tubular instruments without injuring the spinal nerves. Lateral fusion can be performed as an outpatient procedure, and patients often go home the same day. Pedicle screws (minimally invasive) are screws that a surgeon implants into a vertebral pedicle, a thin, bony bridge that connects the back of a vertebra to other structures. The screws can be used to immobilize the spine following trauma or surgery to correct spinal deformity, and they can be used to promote fusion of vertebrae following fusion surgery. Working through a tiny incision and with the help of an imaging technology called fluoroscopy, the surgeon drills a channel in the pedicle and then inserts the pedicle screws. A minimally invasive posterior percutaneous cervical framinotomy is a procedure used to remove bone spurs and herniated discs in the neck that compress a spinal nerve. A pinched nerve can cause pain that radiates down the arm and sometimes into the hand. The goal of the procedure is to enlarge the space where the nerve root exits from the spinal canal, called the foramen. When a bone spur narrows the foramen and compresses the nerve root, a posterior cervical foraminotomy can be used to chisel away the spur and widen the passageway. The surgeon makes a small incision in the back of the neck and then uses a series of tubes to dilate the spine muscles. Transforaminal lumbar interbody fusion (TLIF) is used in the treatment of pain in the lower back (lumbar spine) in patients who suffer from spondylolisthesis, degenerative disc disease, or recurrent disc herniation. It is a minimally invasive procedure in which the surgeon approaches the disc space through the foramen, the area where the nerve root exits the spinal canal. The surgeon makes an incision in the back, then separates the muscles and lifts them off their attachment to the bony vertebrae. Utilizing a tubular retractor and operating microscope, the surgeon enlarges the space between the vertebrae, removes the disc, inserts a cage packed with porous bone into the empty disc space, and secures it with pedicle screws and rods. The bone grows through the holes in the cages, fusing the two vertebrae together. The minimally invasive procedure minimizes soft-tissue damage and avoids the muscle stripping and retraction associated with conventional fusion procedures. Spinal fusion (minimally invasive) is performed to treat spondylolisthesis or a degenerative disc that causes pain and instability in the neck, middle back, or lower back (the cervical, thoracic, and lumbar spine). Fusion involves joining two separate bones (vertebrae) into one to provide stability. The surgeon makes a small incision, then widens it gradually with increasingly large tubes. This tunnel gives the surgeon access to the spine and allows for the implantation of fusion devices. A cage packed with porous bone is inserted in the middle of the disc space and secured with pedicle screws and rods. The minimally invasive procedure minimizes soft-tissue damage and avoids the muscle stripping and retraction associated with conventional fusion procedures. Radiosurgery for spinal lesions can be used to shrink or destroy tumors (lesions) of the spine while eliminating or minimizing damage to surrounding tissue. During the procedure, the physician aims powerful, shaped beams of radiation at the tumor. A highly trained physicist assists in the development of a treatment plan. The target is precisely located; the radiation beam is shaped to the exact shape of the tumor; and the patient is immobilized with a stereotactic body frame while the radiation is delivered. Precise targeting is especially critical if the tumor is on or near the spinal cord. Radiosurgery can be used alone or as a supplement to other treatments, including surgery to extract the tumor or chemotherapy. A spinal osteotomy is a surgical procedure involving the careful and controlled breaking or cutting of one or more spinal bones, or vertebrae. A surgeon performs an osteotomy in order to correct a complex spinal deformity through realignment. Conditions treated with spinal osteotomy include ankylosing spondylitis, kyphosis, and scoliosis. During minimally invasive spinal deformity correction surgery, a highly trained spine surgeon realigns the normal curves of the spine, sometimes in two or three separate operations. Deformities of the spine can appear in young teenagers and can slowly progress throughout a person's life. Deformity can appear as scoliosis (side-to-side curve of the spine), lordosis (swayback of the lower spine), or kyphosis (forward hunch of the shoulders and neck). During corrective surgery, the surgeon decompresses the affected vertebrae, removing bone as necessary. Special screws are implanted into the bone, where they serve as anchors for strong but malleable rods. The rods can immobilize portions of the deformed spine and can be bent to re-shape the spine to a more normal curve. Kyphoplasty is a minimally invasive procedure used to treat vertebral compression fractures of the spine. These painful fractures, which can limit mobility, are typically caused by osteoporosis, spinal tumors, or traumatic injury. During kyphoplasty, the surgeon passes a hollow needle through the skin and into the fractured vertebra with the help of an imaging technology called fluoroscopy. The surgeon inserts a balloon into the fracture, inflates it to expand the vertebra to its normal height, and then withdraws the balloon, leaving a space in the middle of the vertebra. The surgeon carefully injects bone cement, then withdraws the needle before the cement sets. The procedure, which is repeated for each affected vertebra, speeds recovery time and reduces the risk of future fractures. Vertebroplasty is a minimally invasive procedure used to treat vertebral compression fractures of the spine. These painful fractures, which can limit mobility, are typically caused by osteoporosis, spinal tumors, or traumatic injury. During vertebroplasty, the surgeon passes a hollow needle through the skin and into the fractured vertebra with the help of an imaging technology called fluoroscopy. The surgeon carefully injects bone cement into the fractured vertebra, restoring it to its normal height, and then withdraws the needle before the cement sets. The procedure, which is repeated for each affected vertebra, speeds recovery time and reduces the risk of future fractures. During endoscopic spine surgery, the surgeon uses a probe, or endoscope, that is fitted with a tiny camera and light. The surgeon inserts the endoscope through a small incision during a minimally invasive procedure, then watches the images on a monitor while moving the endoscope. Scalpels, scissors, forceps, and other instruments at the end of long, slender handles are inserted through a tube or another point of entry. Image-guided spine surgery (IGSS) is used to ensure surgical accuracy and success. It involves creating a three-dimensional image of the patient's spine. Physicians acquire the image by asking the patient to wear tiny markers, called fiducials, during an MRI or CT scan. During surgery, the fiducials and infrared cameras correlate the patient to his or her 3D computer model. This "global positioning system" for the spine helps the neurosurgeon plan the operation, locate the lesion, and navigate through the patient's anatomy. Spinal cord stimulation for chronic back pain is used to treat severe, chronic pain that cannot be alleviated by conservative measures. In two stages, the surgeon implants one or two electrical leads to the spinal cord or targeted nerves and then a small generator in the patient's back or abdomen, just under the skin. The spinal cord stimulator generator transmits a low-voltage electrical current through the leads to the spinal cord, and the patient experiences a sensation of tingling instead of pain. A medication pump is used to treat chronic, intractable pain that cannot be alleviated by conservative measures. During the procedure, the surgeon implants a small pump and catheter that delivers a concentrated amount of medication to the spinal fluid (intrathecal space) or targeted nerves. The pump is inserted in the patient's back or abdomen, just under the skin. The catheter is then directed under the skin to the back. The pump, which delivers medication in small, precise doses, can reduce or eliminate the need for pain medications. Carpal tunnel syndrome is a condition that causes pain and tingling in the hand and fingers. The median nerve passes or "tunnels" under a ligament (carpal ligament) in the wrist. The nerve can become compressed and inflamed from repetitive movement of the hand and wrist. Carpal tunnel release is an outpatient surgery performed under local anesthetic to relieve pain and numbness in the hand. An incision is made in the wrist and palm and the transverse carpal ligament is cut, releasing pressure on the median nerve and relieving the symptoms of carpal tunnel syndrome. Ulnar nerve syndrome is a condition that causes pain and tingling in the forearm and in the last two fingers of the hand. The ulnar nerve can become entrapped as it passes down the arm and behind the elbow, where it lies in a bony groove. The ulnar nerve can also become entrapped as it passes under ligaments in the wrist. Entrapment at either location can inflame and compress the nerve. Surgery involves making a skin incision at the elbow or wrist and releasing the nerve from the tissue and ligament. Epidural Steroid Injections (ESIs) are used in the treatment of acute or chronic pain in the back, neck, arms, or legs. The injections are often used in the first line of attack against pain. Typically, patients who are candidates for an ESI are suffering from spinal stenosis, spondylolysis, a herniated disc, degenerative disc disease, or sciatica. The ESI is a minimally invasive procedure in which the physician delivers medicine – a long-lasting corticosteroid -- to the spinal nerve. This is accomplished by guiding a needle into the epidural space, the area between the protective covering of the spinal cord and the vertebrae, with the help of an imaging technology called fluoroscopy. The benefits of an ESI can last from days to years. The treatment is helpful in halting pain and reducing inflammation, thereby enabling the patient to resume normal activities and pursue a physical therapy program. Facet Injections and Rhizotomy are used in the treatment of neck or back pain caused by inflamed facet joints. Arthritis, injury, and disc degeneration can cause pain in the facet joints, which connect vertebrae to each other and allow motion of the spine. A facet injection is a minimally invasive procedure in which the physician injects a long-lasting corticosteroid and numbing agent into the painful facet joint with the help of an imaging technology called fluoroscopy. A facet injection, which can bring relief for several days to years, also can be used to determine whether the facet joints are the true source of the patient's pain. If the injection does provide relief, the patient might benefit from a facet rhizotomy. In this minimally invasive procedure, the physician directs a radiofrequency current at nerves surrounding the painful facet joint in an attempt to deaden them and prevent pain signals from reaching the brain. Both treatments are helpful in halting pain and enabling the patient to resume normal activities and pursue a physical therapy program. Radiofrequency Ablation (Rhizotomy) is used in the treatment of neck or back pain caused by inflamed facet joints. Arthritis, injury, and disc degeneration can cause pain in the facet joints, which connect vertebrae to each other and allow motion of the spine. Radiofrequency ablation is a minimally invasive procedure in which the physician directs a radiofrequency current at nerves surrounding a painful facet joint in an attempt to deaden them and prevent pain signals from reaching the brain. The physician can confirm that the facet joint is causing pain by first performing a facet joint injection. During a radiofrequency ablation procedure, the physician injects a needle and numbing agent into the painful facet joint with the help of an imaging technology called fluoroscopy. The physician then inserts a microelectrode inside the needle and delivers a small radiofrequency current to the nerves. Pilates is an exercise program that seeks to strengthen the body's core muscles, or torso, and to improve postural alignment. The core muscles lie within the abdomen and around the spine. The program was developed from techniques first described by the German-born Joseph Pilates, who sought to help rehabilitate soldiers returning from World War I. Because the core muscles help support and protect the spine, pilates can play a role in the holistic treatment of back pain or injury as well as in the prevention of injury. Pilates, usually performed on a floor mat, focuses on stretching, strengthening, postural alignment, stability, and breathing techniques. Yoga is an exercise program that embraces poses, postures, and controlled breathing. It seeks to strengthen and stretch muscles, create balance through flexibility, and alleviate stress. Yoga originated in ancient India, and the word yoga means "union" in the ancient Indian language of Sanskrit. Individuals who are dedicated to yoga strive for a union of body, mind, and spirit. Among other things, yoga strengthens the core muscles of the abdomen and back, which help support and protect the spine. As such, yoga can play a role in the holistic treatment of back pain or injury as well as in the prevention of injury. Spinal Rehabilitation is supervised by a physician who specializes in physiatry, also known as physical medicine and rehabilitation. The physiatrist specializes in the diagnosis and treatment of patients with acute and/or chronic illness or pain, including back pain. The physiatrist seeks to help the patient achieve optimal function and quality of life through the reduction of pain and the adaptation to assistive devices, including braces and wheelchairs. Depending on the patient's needs, the rehabilitation team may also include physical and occupational therapists, speech pathologists, and social workers. Self Care and Braces - Patients can protect their back and further the healing process by using correct posture, by keeping the spine in alignment, by wearing a brace if recommended, and by following through with physical therapy or a regular exercise program. The lower back bears most of a person's weight, so proper alignment can prevent further slippage and injury to the spinal nerves and discs. Proper lifting habits – keeping the back perpendicular and bending at the knees -- can also protect against injury. Wearing a back brace may be advisable while the abdominal and lower back muscles are being strengthened following surgery or an injury. The brace can decrease muscle spasm and pain as well as help immobilize the spine during the healing process. Holistic Medicine, also known as alternative or complementary medicine, focuses on the whole person rather than the person's physical ailment alone. As such, holistic medicine considers the patient's physical, mental, emotional, and spiritual health during treatment. Holistic health presumes that a person must be healthy in body, mind, and soul if true wellness is to be achieved. Physicians often integrate principals of holistic medicine – including exercise, diet, smoking cessation, and reduction of anxiety -- with scientifically proven medical or surgical treatments. Holistic medicine can be a beneficial and complementary component to spinal rehabilitation and prevention of illness or injury. Acupuncture is an ancient medical art that originated in China thousands of years ago and has gained advocates in the United States. It is a form of alternative or complementary medicine involving the stimulation of specific points on the body through the insertion of thin metal needles. Underlying the concept of acupuncture is the Chinese medical philosophy that the body contains two opposing forces: yin (cold and slow) and yang (hot and active). When yin and yang are unbalanced, the body is unhealthy. The Chinese, drawing on a matrix of 2,000 acupuncture points, used acupuncture to restore that balance and to block pain. Medical Pain Management involves the management and control of acute or chronic pain with medications. Acute pain is directly related to tissue damage and has an obvious source. Chronic pain, whose origin can be difficult to pinpoint, is persistent and can last months. In some cases the brain will continue to receive pain signals even after an injury has healed. Amputees are known to experience pain, known as phantom pain, in a limb that is no longer there. Chronic pain also is frequently present in ongoing conditions, such as arthritis or cancer. The Mayfield Clinic provides only surgical treatment for pain, but numerous organizations offer medical options that also can include holistic treatment. Interventional Pain Management involves the diagnosis, management, and control of acute or chronic pain with minimally invasive techniques. It is an option for patients whose pain is not adequately relieved by standard medical pain management. A team of specialists provides interventional pain management, which can include epidural injections, facet injections, discography, and radiofrequency ablation (rhizotomy). Acute pain is directly related to tissue damage and has an obvious source. Chronic pain, whose origin can be difficult to pinpoint, is persistent and can last months. In some cases the brain will continue to receive pain signals even after an injury has healed. Amputees are known to experience pain, known as phantom pain, in a limb that is no longer there. Chronic pain also is frequently present in ongoing conditions, such as arthritis or cancer. Spinal Cord Injury Rehabilitation is a highly specialized and continuing process. It brings together a multidisciplinary team that includes rehabilitation specialists, psychologists, social workers, and physical, speech, and occupational therapists. The rehabilitation process includes inpatient and outpatient care and is determined by the type and severity of the patient's injury. The goal is to help each patient regain as much independence as possible while furthering his or her re-entry into the community. Spinal cord injury rehabilitation includes an educational component for both patient and family members. Physical Medicine and Rehabilitation (PM& R) is a specialty whose physicians – known as physiatrists—diagnose and treat injuries and illness that involve movement. Physiatrists treat the whole person, not just the physical problem. They are experts at diagnosing and treating acute and/or chronic pain. The physiatrist seeks to help the patient achieve optimal function and quality of life through the reduction of pain and the adaptation to assistive devices, including braces and wheelchairs. Depending on the patient's needs, the physiatrist's rehabilitation team may also include physical and occupational therapists, speech-language pathologists, and social workers. Bone Scans use nuclear technology (gamma rays) to help physicians diagnose stress fractures, arthritis, infections, and cancer. A radioactive tracer, which gives off particles that can be scanned, is injected into a vein in the arm. The tracer then circulates through the bloodstream and collects in the bones over a period of a few hours. During the test, the patient must drink plenty of fluids to help flush unabsorbed tracer. If the patient is being tested for a bone infection, images are taken shortly after the radiotracer is injected and again 3 to 4 hours later, after it has collected in the bones. If the patient is being tested for metastatic bone disease, images are taken only after 3 to 4 hours. A bone scan also can reveal hot spots (increased bone metabolism) and cold spots (decreased bone metabolism). The radioactivity delivered by a bone scan is less than a chest x-ray and disappears within one to three days. In extremely rare cases, a patient may develop a rash, swelling, or anaphylaxis. MRI (magnetic resonance imaging) is a painless, noninvasive diagnostic test that provides a detailed view of the soft tissue of the spine or brain. An MRI machine creates images by using a powerful magnetic field, radio waves, and a computer. The images are taken in slices, from the side, front, or bottom. The test is most often used in the diagnosis of tumors, strokes, and disc herniations. CT (computed tomography) is a painless, noninvasive diagnostic test that provides detailed images of bone, soft tissues, and blood vessels. It provides a rapid and effective way to look inside the body in an emergency. A CT machine uses x-rays and a computer to create cross-sectional images, taken in slices. The test is used in the diagnosis of brain damage in head injuries, blood clots, intracranial bleeding, fractures, hydrocephalus, spinal stenosis, herniated discs, and spinal cord damage. X-ray imaging is a painless, noninvasive diagnostic test that provides pictures of bones, bone fractures, and foreign objects. An x-ray machine creates images by directing radiation waves through the body and onto sensitive film. The portion of the x-ray that is not absorbed exposes the film on the other side. The denser the tissue, the more x-rays it absorbs. X-rays are not highly effective at showing nerves or herniated discs. During an x-ray the patient is exposed to a small amount of radiation. Fluoroscopy (C-arm), which uses the same technology as an x-ray, is a painless, noninvasive procedure that can serve as a diagnostic test and can also provide image guidance to a surgeon, enabling the surgeon to track instruments inside the human body during an operation. Fluoroscopy directs radiation waves through the body and onto a fluorescent screen, enabling the surgeon to view images in real time. It helps the surgeon identify specific vertebral levels and place pedicle screws during surgery, and it helps pain specialists guide needle placement during injections. DEXA Scans, also known as bone density tests, use x-ray technology to measure mineral density in bones and to diagnose osteoporosis before a person's bones become so weak that they break. Early detection of bone density loss can lead to early treatment to minimize further bone loss and strengthen bone tissue. During the scan, the patient rests on a padded table, while an x-ray scanning machine moves over the body and captures images of the hip, spine, or entire body. The scan employs a technology known as "dual energy x-ray absorptiometry," or DEXA. Two energy beams – a high-energy beam and a low-energy beam – are passed through the bone. Bone density is determined by the difference between the two beams. The scan takes about 20 minutes. Unless instructed to move, the patient must remain still during the scan. Discography is a minimally invasive procedure that produces an x-ray of intervertebral discs. A discogram can identify discs that cause pain and helps the surgeon plan neurosurgical treatment. The surgeon uses fluoroscopy to guide a needle into the disc space, then injects a dye and antibiotics. X-rays and CT scans are taken after the needle has been removed. EMG (electromyography), often done in conjunction with a nerve conduction velocity (NVC) study, is a diagnostic test that measures muscle strength and the electrical activity of nerves. The EMG test helps determine whether muscle weakness is resulting from nerve damage, another muscular condition, or the patient's reluctance to use the muscle because of pain. During an EMG, the physician inserts very thin needles into the affected muscles. An electrode attached to each needle sends signals to a machine, allowing the physician to analyze the muscle and detect peripheral nerve damage.